"The Ghosts of Mars" - Part Three: "Run, Man, Run"
J'onn and the spirit of his dead brother Ma'alefa'ak continue their trip down memory lane first by reliving the deaths of the Martian race and then by reliving when the League reformed with "the magnificent seven" of Superman, Batman, J'onn, Flash, Green Lantern, Wonder Woman and Aquaman. J'onn once again experiences how he convinced a hesitant Wally to join despite his own self-doubt, even going so far as to show him the Watchtower. Ma'alefa'ak accuses J'onn of altering his friend's minds to reform the League so that he could have his precious family back. J'onn realizes that all of what he was remembering was a lie, but Ma'alefa'ak insists it to be true and reminds him of when the President of the United States outlawed super-heroes and J'onn dissolved the League after the deaths of Vibe and Steel. Once again J'onn relives past experiences before he finally breaks free of his brother's influence and the two fight on the spiritual plane. During the fight J'onn hears the voice of his dead wife, which had long been silent, and suddenly finds himself under the ocean. Black Manta sits on a throne with Aquaman's son floating in a bubble beside him. Aquaman is there too and tells J'onn that if he doesn't kill the Manhunter his son will die. Story - 3: In this issue Justin Gray makes good use of League continuity and shows that, if nothing else, he has read JUSTICE LEAGUE: A MIDSUMMER'S NIGHTMARE and the first JLA SECRET FILES AND ORIGINS. I will admit that while reading this chapter of "The Ghosts of Mars" I was sucked into thinking that Gray was retconning League history with abandon, which upset me greatly. When it was revealed that all of that was Ma'alefa'ak messing with J'onn's head I was nearly impressed. It was a sneaky writer's trick and I am sure, either consciously or unconsciously, Gray did this on purpose. But like I said last time, despite this I'm still not having any positive feelings towards this story. And I've been thinking about that over the last two days. Why am I having such a problem with this story? It's not bad. I have certainly read worse over the years. It has good characterization and Gray is not a bad writer. He's not the best, but I can't classify him as someone who produces work that is unreadable. The story isn't bad either. I mean looking into J'onn's past and mucking around with his head is an interesting story and probably one worth telling. I'm just not connecting to it on any level beyond annoyance. Sometimes that happens in comic books. There are stories that do nothing for you while others make you happy beyond belief. In an attempt to be positive I will say that I was impressed with Gray's use of League history. He has delved into just about every incarnation and used it to good effect. I appreciate that. I really do. It's rare to see that these days. I am curious to see what my perceptions of this series would be if I waited until the whole thing came out and read it all at once, but since they are releasing this story bi-weekly and I am getting it on a somewhat regular basis I doubt that. You may like this story, and if you do more power to you. It's just not for me. Art - 4: Still digging on the art, though. Leonardi knows how to lay out a page and I like his use of "camera angles" to produce neat looking shots. The art is making this story worthwhile on some level, I just haven't figured out what level that is yet. Cover Art - 4: The reason this cover gets a four is because I like Leonardi's work. The art itself is fine. 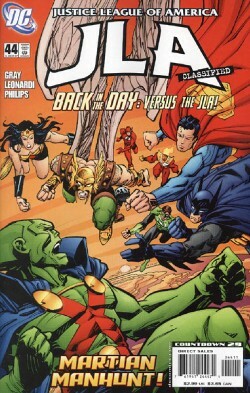 I'm just wondering why we got two covers in a row with the League attacking J'onn. Seems a bit repetitive to me.